This article by Christine Gelley was originally published by The Noble Journal Leader on December 3, 2018. 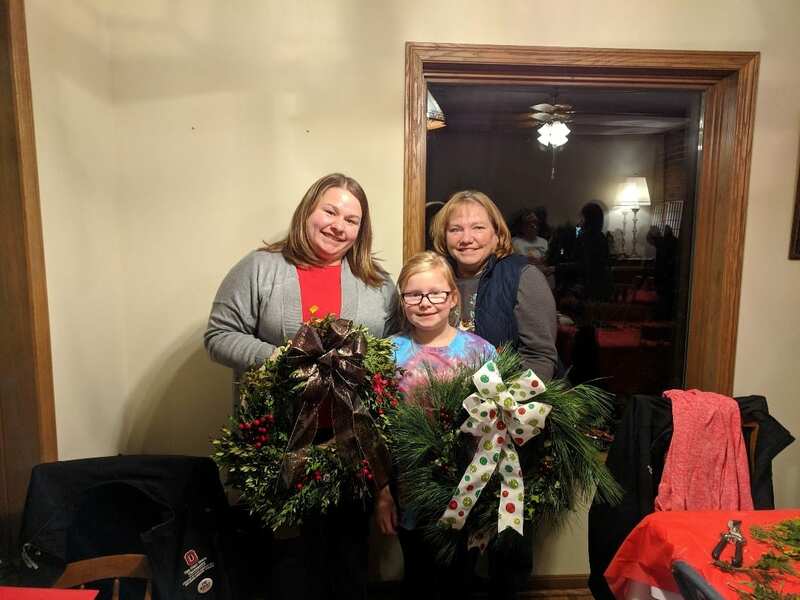 For the third year, the Noble County Master Gardener Volunteers hosted a set of Holiday Wreath Making Workshops at the Ball-Caldwell House during the week following Thanksgiving. 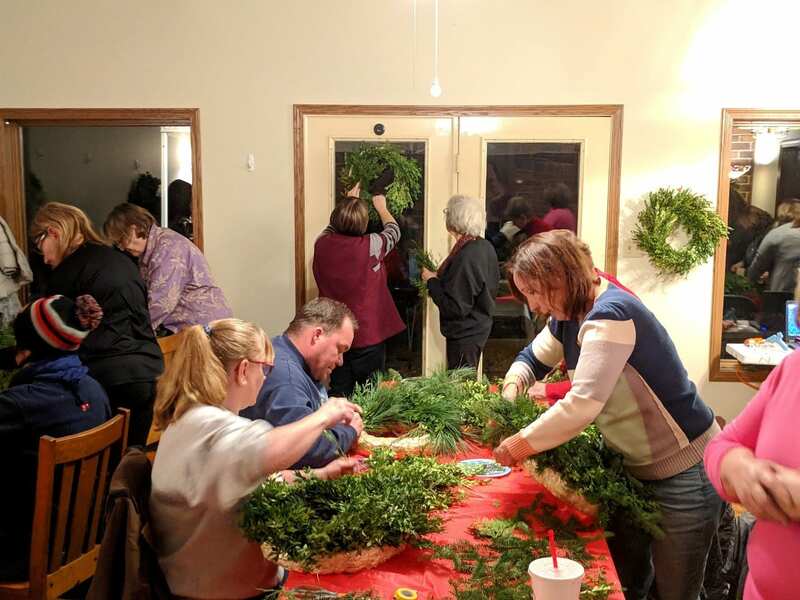 Over three sessions, thirty-six people from Noble and surrounding counties created their own unique wreaths from freshly cut evergreen material. 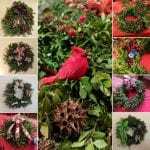 Each class started with the same material stock, but no two wreaths were alike. With themes ranging from natural to glitzy, the personality and individuality of the wreath creators were apparent in their designs. Fresh locally cut greenery of pine, fir, cedar, boxwood, juniper, and holly provided varieties of colors, shapes, textures, and scents. The results were stunning. Along with a beautiful holiday decoration, attendees took home knowledge about how to care for greenery indoors. This includes keeping flammable greenery away from heat sources, both due to the risk for a fire and to prevent premature drying of the material. Many Americans still enjoy a fresh-cut live tree during Christmas. Live trees are wonderful from a nature enthusiast’s perspective because they bring the peace of the outdoors into your home. Meticulous housekeepers may prefer artificial trees because they are easy to pack, store, and are less messy. However, artificial trees are less environmentally friendly than cut trees. Artificial trees are not easily recyclable and they do not biodegrade. Live trees on the other hand can be turned into wildlife habitat, kindling for a campfire, or compost after the holidays. Anytime you bring plants inside there is a risk that insects, birds, or a mammal could be at home in the tree. Check for and remove any insect or bird’s nests, before decorating your tree to help prevent accidental home invaders. Remember that any pests you encounter on an evergreen tree chose the tree as their habitat. Therefore, most hitchhikers in your house would not become a residential pest. The number one rule of setting up a live Christmas tree is keeping it watered. The tree water pan should be checked each day and adequately refilled. This will help prevent the needles from drying out and lower your risk of a holiday house fire. 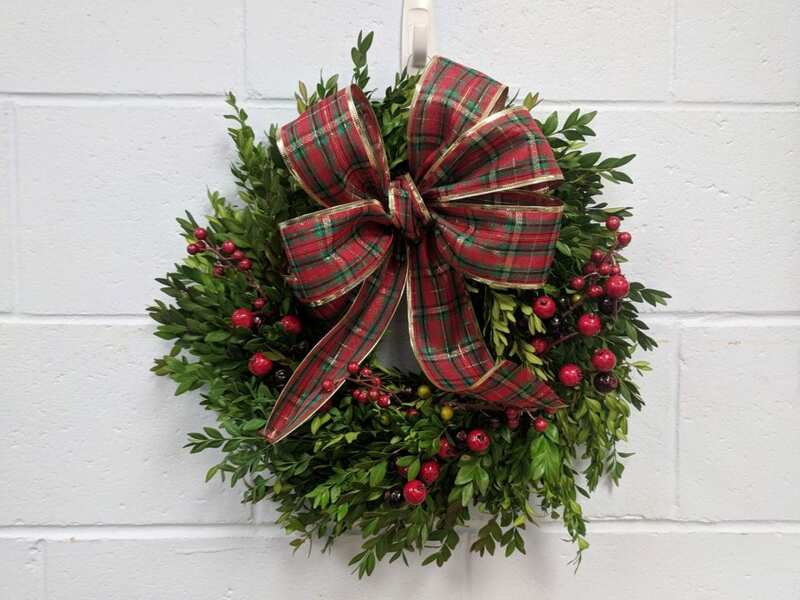 For more information about using fresh cut evergreens as décor during the holidays, call the Extension Office at 740-732-5681 and ask for Christine. 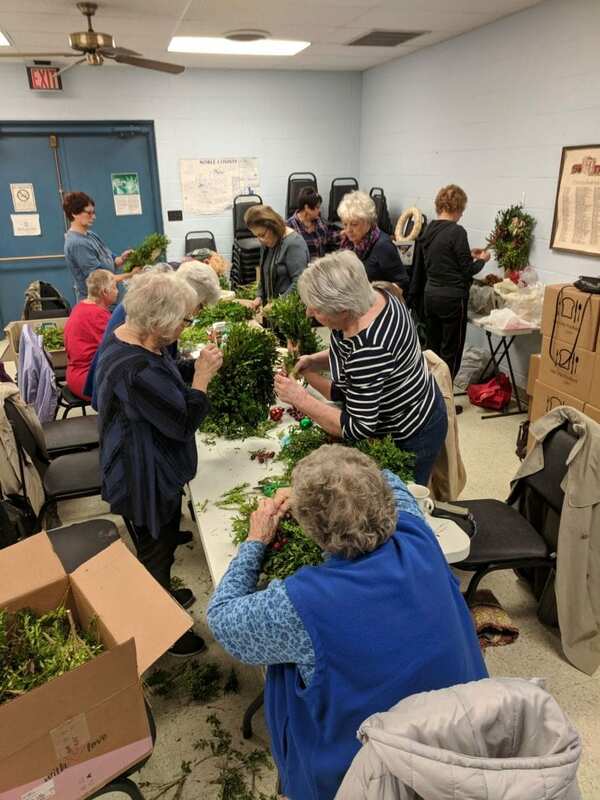 The Noble County Master Gardener Volunteers thank everyone who attended the workshops for their creativity and enthusiasm. We also thank the Noble County Historical Society for providing a beautiful setting for the classes. We look forward to offering this event again in 2019. This article by Christine Gelley was originally published by The Noble Journal Leader on November 26, 2018. I hope that the best leftovers in your house this week are fond memories of time spent with people you treasure. There are likely to be a variety of other things left over as well. Do not let leftovers go to waste. There are many ways to use the food and décor left over from the harvest season in alternative ways. 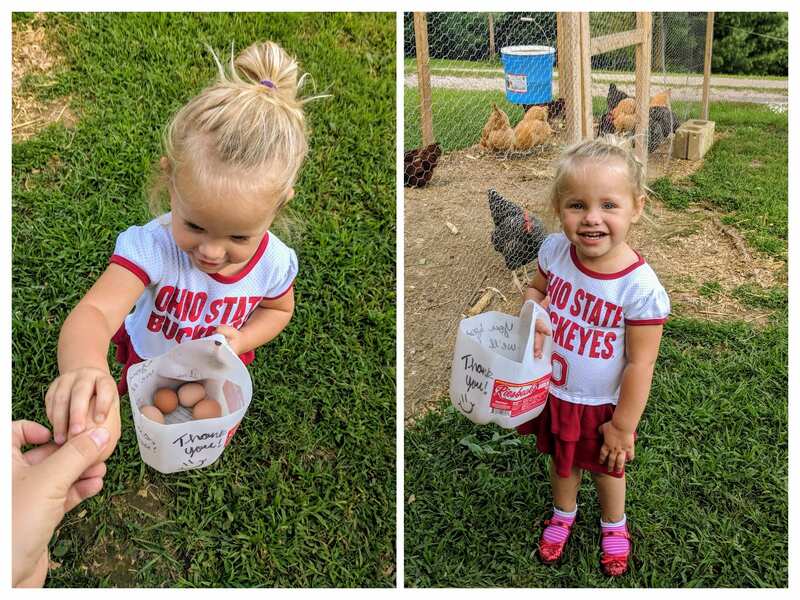 When it comes to preserving and using the leftovers from your Thanksgiving meals, consult OSU Extension FCS/4-H Educator Sami Schott at the Noble County Office about how to store and prepare leftovers safely. You can also visit www.ohioline.osu.edu to explore a variety of fact sheets on the topic. Before you scrape leftover food into the trash can consider whether it could be composted. Fruits, vegetables, and breads are good additions to the compost pile. However, do not add meats, bones, gravies, or dairy products to compost. These are more difficult to break down and often attract scavengers to the compost bin. Some farm animals would love to share leftovers with you too. Hogs and poultry are resourceful critters and would be happy to receive table scraps and leftover pumpkins. Again, avoid feeding bones and meats, because they could attract predators to the leftovers and the livestock. If you are feeding commercial livestock table waste, be sure to check that it is compliant with federal and state laws. Also, be sure to double check for plastic wrap or aluminum foil particles before putting the scraps out as feed. While it may be tempting to share leftovers with your pets, be very careful about what you share. Poultry bones can be deadly if ingested by canines or felines. The fat and skin from turkey or ham can cause digestive difficulties. Avoid onions. Small amounts are ok, but too much could lead to anemia. Chocolate and desserts with high sugar or artificial sweeteners are definitely off limits. Green beans, cranberries, plain mashed potatoes, squash or sweet potatoes could all be delightful for dogs in small portions. Consult your veterinarian if you have specific concerns about sharing leftovers with your pets. Other autumn décor like decorative squash, corn stalks, dried grasses, and raked leaves can all be added to the compost bin as well. If you crack open squash, birds and small mammals can enjoy the flesh and seeds in your garden bed. In turn, you may wind up with some unique homegrown décor the following year if you let the seeds sprout in the spring. Before we move on to celebrating winter holidays, let’s remain thankful for the harvest season by respectfully utilizing the leftovers. How often do we tell the senior citizens in our community that we are thankful for them? In the Noble County community, a large portion of our senior population remains extremely active in the workforce, the church, public service, and childcare. They are integral pieces of the puzzle that make our community a wonderful place to live. We should let them know how thankful we are for them. When the time comes that those very active seniors take a step back and spend more time at home, we should still communicate how thankful we are for their influence in our lives. One way that OSU Extension is saying “Thank You” to our seniors is by offering programs specifically tailored for them. One of the programs we have offered in 2017 and 2018 is Kindred Gardens: Gardening for Seniors. Kindred Gardens has been offered as five staggered classes per year at the Joyce M. Davis Senior Center in Caldwell. Our final class of 2018 was a floral design class where attendees made their own boxwood holiday wreaths. The senior center has been a great location for the class. It is centralized and has public transportation. However, we also acknowledge that many of our seniors do not utilize the center. Looking into the future, OSU Extension would like to offer the Kindred Gardens series in another location, outlaying Caldwell, if we have seniors interested in attending. 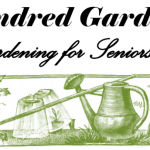 If you are a senior or know a senior who would be interested in attending Kindred Gardens in 2019, please call 740-732-5681 or write to the Noble County Extension Office care of Christine Gelley at 46049 Marietta Rd. Suite 2, Caldwell, OH 43724. We are interested in potential locations to host the program that will allow us to reach more of our seniors with an interest in gardening. If you have other ideas of how we can show our thanks for our seniors through Extension programming, please pass those along as well. Best wishes to you for a very happy Thanksgiving! This article by Christine Gelley was originally published by The Noble Journal Leader on October 29, 2018. Assuming he is right, that means a great number of farm owners and business operators are behind on starting their business succession plans. The whole point of creating a business succession plan is to work through many of the common issues associated with transitioning business leadership before the change happens. Whether the change is forthcoming or an abrupt surprise, having a plan in place prior to needing one reduces both financial and emotional stress on family and business relationships. The landscape of farm owner and operators will change dramatically over the next twenty years and the business sector needs to get prepared for what is to come. The USDA Census of Agriculture has been tracking the age of farm managers for decades. Data continues to show the average age increasing from one census to the next. The 2012 data showed that the average farmer in the United States of America was 57 years old (Marrison, 2017). Data from 2017 will be released soon. Kansas State University hosted a Ranching Summit recently that included a segment on changes to anticipate over the next two decades. Guest speaker, Tom Fields of the University of Nebraska, communicated the magnitude of the shift we will soon see with America’s farm and ranch land. 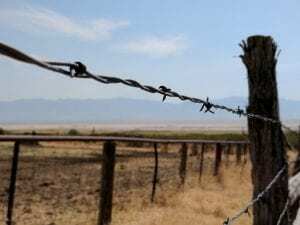 He stated that within the next 20 years, 60 percent of America’s farm and ranch land is going to transfer to a new generation, which would be the biggest real estate exchange since the Louisiana Purchase (Veselka, 2018). Are farmers prepared for this shift? Are you prepared for a leadership shift in your business? There are steps to follow to help you prepare. They include estate and ownership transition planning, a SWOT analysis, family conversations, asset transfers, staff training, retirement planning, contingency plans, and establishing implementation timetables. The process of creating a business succession plan can feel uncomfortable, but in the end, it should help create a smooth transition when a business leadership change occurs. To learn more about business succession planning, consult OSU Extension Fact Sheet ANR-47 “Planning for the Successful Transition of Your Agricultural Business” by David Marrison. It is available online at https://ohioline.osu.edu/factsheet/anr-47 or from your local Extension Office. 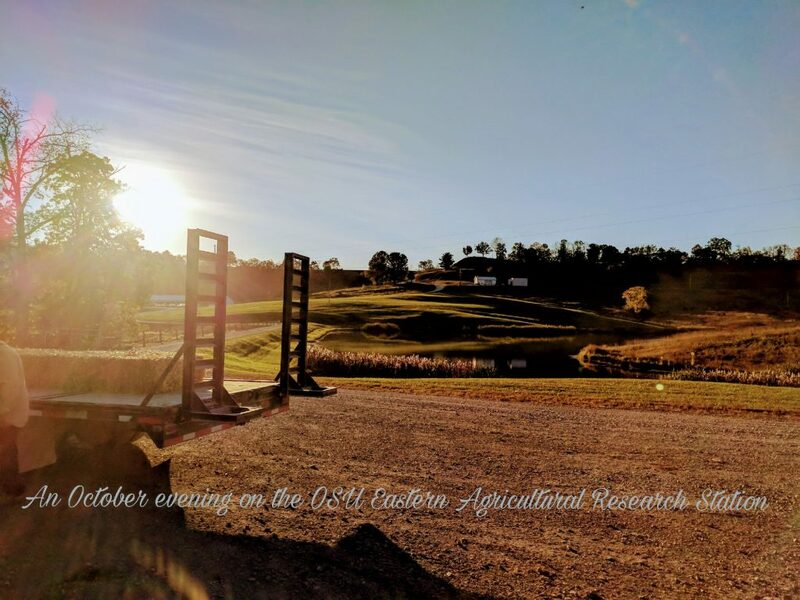 David Marrison currently serves as the Extension Educator for Agriculture and Natural Resources in Coshocton County and is a nationally recognized teacher in the field of Farm Business Management. Another opportunity to learn more is to attend an in-person workshop taught by David Marrison over breakfast at 8:30 a.m. on Friday, November 16. This free program will take place at the Noble County Extension Office (46049 Marietta Rd. Caldwell) and conclude at 10 a.m. The program is open to business owners of all kinds. Please RSVP for the program by calling 740-732-5681 or emailing Community Development Educator, Gwynn Stewart, at stewart.1818@osu.edu before November 12. Marrison, David L. “Planning for the Successful Transition of Your Agricultural Business.” Ohioline, The Ohio State University, 8 Feb. 2017, ohioline.osu.edu/factsheet/anr-47. Milligan, Bob. “Ranch Transfer Is More than a Generational Transfer.” Progressive Cattleman, Nov. 2018, pp. 19–20. Veselka, Carrie. “K-State Ranching Summit: Embracing Disruptive Technology.” Progressive Cattleman, Nov. 2018, pp. 16–18. Where Is Our Autumn Color? 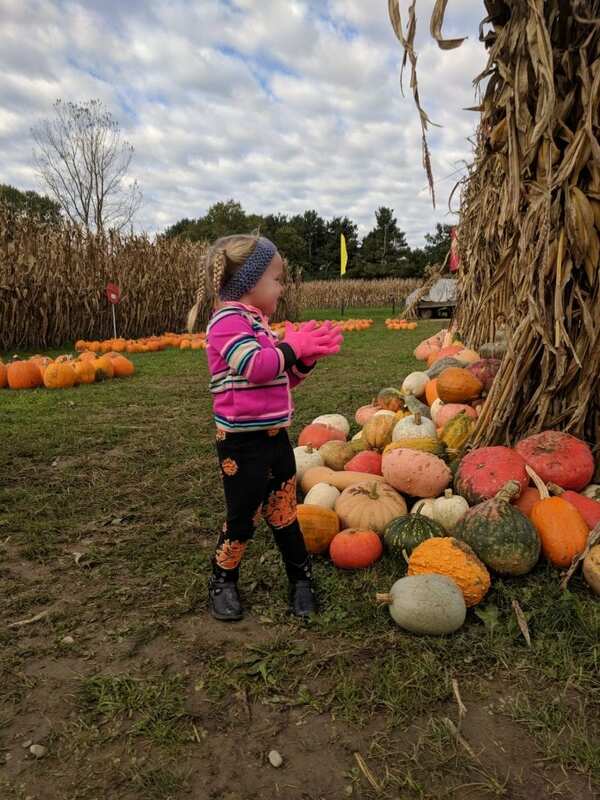 This article by Christine Gelley was originally published by The Noble Journal Leader on October 22, 2018. 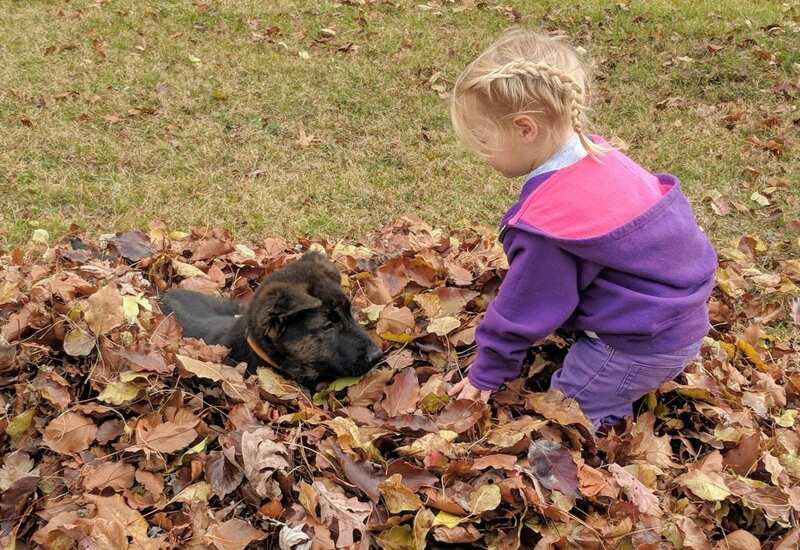 Brindle and Bethany Gelley play in a pile of autumn leaves. October is by far my favorite month in Ohio. The crisp cool air, the autumn colors, and an excuse make a hearty pot of chili are just a few of the reasons. In conversations with others who love October, we tend to wind up disappointed with the lack of brilliant autumn colors so far this year. It is true that the color change we see with deciduous trees this year is drastically different from last year. By the fourth week of October, most of Ohio’s deciduous forests are a warm mix of orange, yellow, red, and purple hues. Here in 2018, we mostly have a dull green color with a little yellow and red. Where is our beloved autumn color? You may remember from a previous article that the pigment changes in the leaves of deciduous trees are the result of chlorophyll break down. Chlorophyll is the green pigment expressed in the leaves during spring and summer. It absorbs energy from sunlight to fuel the process of sugar production in the plant, which is called photosynthesis. When day lengths grow shorter and temperatures get cooler, photosynthesis slows, and chlorophyll production dwindles. In the absence of chlorophyll, other pigments are expressed including carotene, xanthophyll, and anthocyanin. Color changes are most dramatic in years where summer transitions to fall with a series of warm sunny days, followed by crisp (but not freezing) nights. Warm and wet fall weather tends to delay the color change. The consistent moisture we have had all year and the lack of cool nights in the first two weeks of October are likely the cause of a slow color change. If we get lucky, a series of sunny days, cool nights, and a dry stretch could still trigger some pretty colors before a hard killing frost. To track the progression of fall foliage changes in Ohio, follow the Ohio Department of Natural Resources Fall Color Reports at http://fallcolor.ohiodnr.gov/. Another version of this article by Christine Gelley was originally published by The Noble Journal Leader on September 10, 2018. It was a rainy evening at the Eastern Agricultural Research Station on Thursday, June 21, but Southeastern Ohio Hay Day 2018 went on without hesitation. Over 100 people from Ohio and Pennsylvania gathered at the farm to see equipment demonstrations and listen to presentations about making high quality hay. Tractor dealers were present from L & H Tractor Sales of Caldwell, Baker & Sons Equipment of Lewisville, Lashley Tractor Sales of Quaker City, and JD Equipment of Zanesville. Each brought company representatives and demonstrated new equipment to local hay producers. Additional representatives from Anderson, Kubota, Woods, Rhino, and John Deere shared history of their companies, updates on what new investments have been made to provide better equipment for their customers, and insight on future endeavors. New at this year’s Hay Day was a tradeshow. 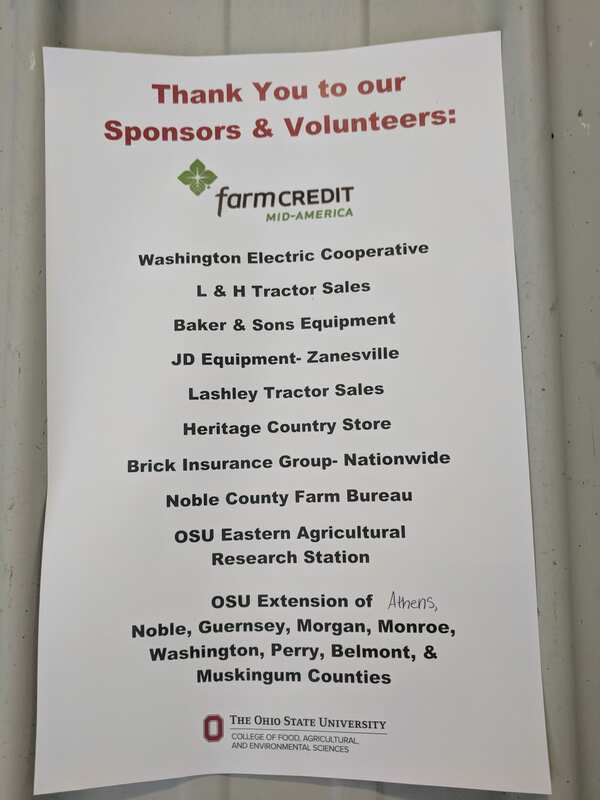 Noble County Farm Bureau, Brick Insurance Group, and Heritage Country Store spent time with attendees sharing how their goods and services can be helpful for their farms. Farm Credit Mid-America and Washington Electric Cooperative sponsored the refreshments offered during the program. Extension personnel from Athens, Belmont, Guernsey, Harrison, Jefferson, Monroe, Morgan, Muskingum, Noble, Perry, and Washington Counties worked together to coordinate the event. The Eastern Agricultural Research Station staff were wonderful hosts, accommodating all in a welcoming environment. Special thanks are extended to all who attended Hay Day this year and to our dealers, vendors, and volunteers! We will continue to bring you this program in years to come. Save the date for the next Southeastern Ohio Hay Day on June 18, 2020. Did you know that the best time to prune fruit trees in Ohio is March? March is the perfect time because it is the end of the dormant period. At this time the trees are not actively growing, the risk for cold injury on wounds is low, and there is less risk of pathogen entry. Young fruit trees and mature fruit trees have different needs when it comes to pruning. Neglected trees are worth an article of their own. Young fruit trees (1-5 years) need to be trained so that the framework of growth is desirable for both growth and harvest. When planting new trees, trim any branches below 24 inches. Ideally, you will want three to four evenly spaced branches around the trunk to use as scaffolds. 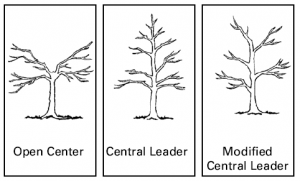 Select your training style: open center, central leader, or modified central leader. The most common style is central leader. Open center is often used for peaches, plums, and apricots. It allows good light filtration to reach all of the tree’s branches. Modified central leader is often used for apples, pears, and pecans. Side shoots should be trained to grow at a 60 to 70 degree angle. When choosing which limbs to prune and which to train, consider symmetry for even fruit production and light filtration to lower branches. During the harvest season, mark any branches that produce shriveled and dried fruit to be pruned during the dormant season. Any damaged or diseased branches should also be removed. Pruning mature trees may reduce number of fruit produced, but fruit size will be increased, ripening will be more uniform, sugar accumulation will be greater, and there will be fewer disease and pest problems as a result of better light filtration and air circulation. If trees are vigorous growers, prune more aggressively. 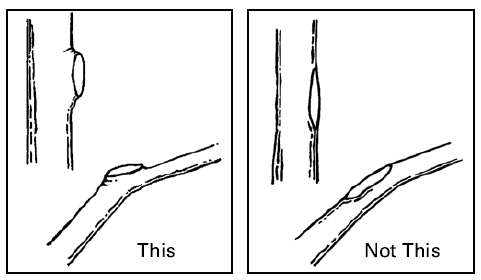 Avoid pruning too close to the main branch to keep wound size minimal. If the tree is very large or neglected, spread extensive pruning out over multiple years. Match your pruning tools to the size of branches. Use shears for small twigs, lopping shears for medium branches, and a hand saw for large limbs. 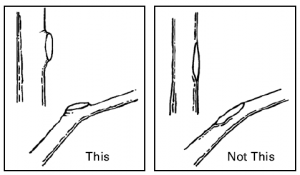 There are many aspects to pruning fruit trees correctly. For more details and illustrations, you can access the Midwest Home Fruit Production Guide for examples at: http://go.osu.edu/MWFPG. This article was first published in the Oct. 9, 2017 edition of The Journal. The most relaxing place I know is a ridge top in October that overlooks a deciduous forest. That place is where I can find inner peace. With a good cup of coffee in one hand and an excellent book in the other, that is my place of solitude. So today, I will pay homage to the leaf pigments that create the splendid colors of October. Deciduous trees are those which drop their leaves in autumn. Before the leaves drop, a color change occurs. The leaves of some trees turn a crusty brown. It gives the illusion that the leaf has simply died and will drop, but it is really more complex than that. Within the leaves are a complex combination of pigments. Usually the pigment that is most apparent in the spring and summer is chlorophyll. It is responsible for green leaves. Therefore, when leaves begin to change it is the sign that chlorophyll is breaking down (due to fewer hours of sunlight during the day) and we see a color change. Where do the other pigments come from? The other pigments were there all along, we just couldn’t see them. If chlorophyll was the dominant pigment, we only saw green. When chlorophyll declines, the other pigments are expressed. Carotene and xanthophyll pigments exhibit yellow colors. Anthocyanin pigments are responsible for reds and purples. In acidic conditions red is widely expressed and in alkaline conditions blue is expressed. The combinations of these pigments vary from species to species, tree to tree, and even leaf to leaf. They create the lovely variety of fall colors so many of us enjoy this time of year. In wet years, you may see more reds and purples. In dry years, you may see more yellows and oranges. This is because anthocyanin pigments are water soluble. A great local place to observe the autumn scenery is the Eastern Agricultural Research Station in Belle Valley. On a clear day from the overlook at the top of the ridge, you can see for miles. I encourage you to come and see. A great time to do that would be at Beef and Grazing School, which continues on Tuesday, October 10 and Tuesday, October 17. Both programs run from 5:30-8 p.m. If you would like to know more details about these events, please call 740-732-5681. A version of this article by Christine Gelley was originally published by Farm and Dairy on July 20, 2017. Summer 2017 has certainly been a wet one so far. 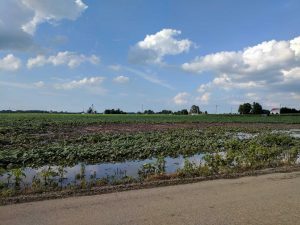 Damage to agricultural land and crops has been noted across Ohio and beyond. Corn and bean setbacks seem to draw the most attention, but pasture damage is prevalent and concerning as well. Remediation of damaged pastures begins with evaluation. Many of the forages used in our region are fairly resilient to submersion and waterlogged soils. How resilient they are depends on many factors including temperature, length of the stress period, depth of the water, growth stage of the plant, and silt deposition. Other associated concerns to be evaluated include stand age, animal activity, potential diseases related to flooding, erosion, and transport of weed seed from one property to another. 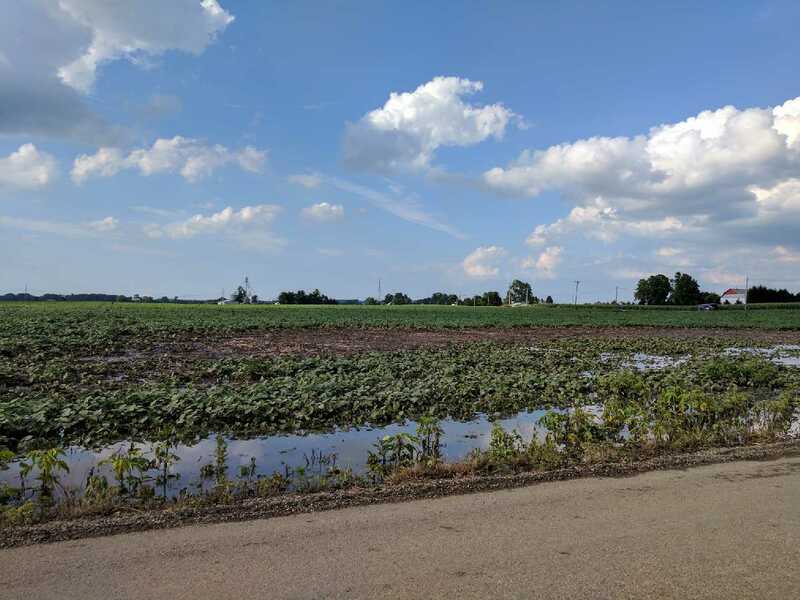 Warm temperatures increase the rate of plant damage and death, which is partially why summer flooding can cause more damage to plant tissue than spring floods. The longer the water sits and the deeper it becomes, the greater the chances for plant death. Standing water is more detrimental than flowing water. The more leaves that reach above the water surface, the better. Erosion will create soil fertility issues and silt deposition may suffocate some plants. Most of our common forages will tolerate 2 inches of deposited silt or less without substantial damage. Actively growing alfalfa will typically recover from 3 days submerged. Phytophthora scouting should be done about a month following flooding and action taken if detected. Ryegrass and orchardgrass will survive several days submerged and tall fescue will persist even longer. Legumes tend to be less tolerant of submersion than grasses, but can persist exposed in waterlogged soils for extended periods. Alfalfa can typically survive 1-2 weeks of waterlogged soils, while white clover can tolerate up to three weeks, and red clover up to four weeks. Water flow patterns can flush soil, weed seeds, manure, and microbes into flooded pastures and cause concerns for animal health. If deposited silt levels are too high, animals may accidently consume substantial amounts while grazing, which can cause digestive issues. Weed seeds can be swept into the pasture and establish themselves in the damaged areas, crowding out the desirable forages during flood recovery. Detrimental weeds taking over damaged areas will reduce intake of high quality forages and may pose risks if poisonous plants become established. In times of pasture stress, animals are more likely to consume poisonous plants in an effort to find enough to eat. Microbes and parasites are also easily transported into grazing pastures if water flows through an area of manure or sewage storage. It would be best to wait a week or two to return animals to pastures that have been flooded with tainted water. This will help maintain good herd health. Also, do not return animals to the pasture and/or use equipment in waterlogged areas until you can travel through the field without compressing the soil. Grasses that form a thick sod will be able to accommodate grazing more quickly than bunch type grasses. 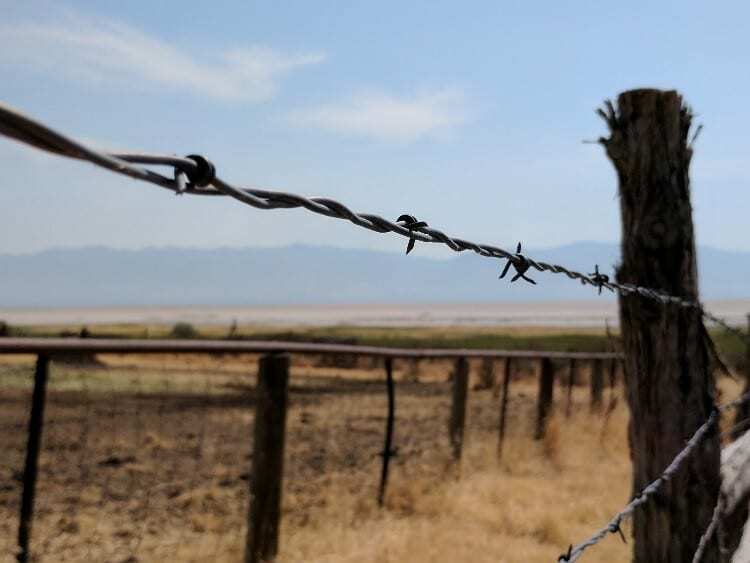 Once the water has drained from the pasture and the soil, investigate if there are any management decisions you could make now to reduce damage if a duplicate flooding event occurred. Consider reseeding heavily damaged areas. Choose varieties that will withstand the conditions of your operation. Consider planting an annual forage to compensate in such areas as an emergency crop while you plan for the long term. Planting an annual forage will reduce further erosion, provide competition for weeds, and supply feed for animals more quickly than perennials. Annual ryegrass offers excellent tolerance to poorly drained soils, wheat has good tolerance, while oats, rye, and sorghum-sudangrass offer fair tolerance. When the flood has receded and the sunshine returns, look forward to the future. Remember what you have learned and imagine the possibilities of tomorrow, rather than dwelling on the troubles of yesterday.